Today we are pleased to be feature Caldecott Honor winner, Denise Fleming in the author-illustrator spotlight! 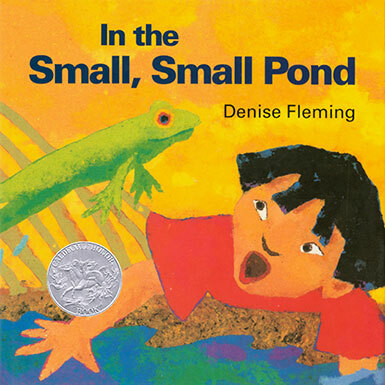 Denise is the author of many books, including Caldecott Honor winner, IN THE SMALL SMALL POND. 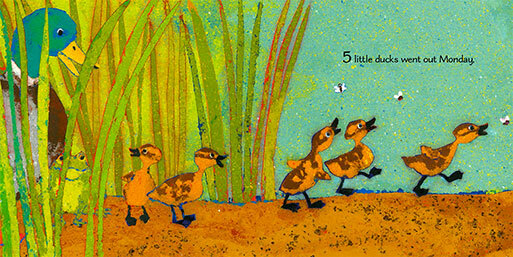 Her newest book, 5 LITTLE DUCKS will be released in November. Tell us about your background and how you decided to become an author/ illustrator. I have been creating art and making up stories ever since I can remember. From 3rd grade to 8th grade I attended Saturday morning art classes at the Toledo Museum of Art. My friends and I took the bus and arrived early at the museum. We would stroll the galleries making up stories to go with the paintings hanging on the walls. I bet you didn't know, there had been a drowning in one of Monet’s lily pond pictures. Only we knew that (because we made it up) along with other tidbits, that became racier as we entered puberty. 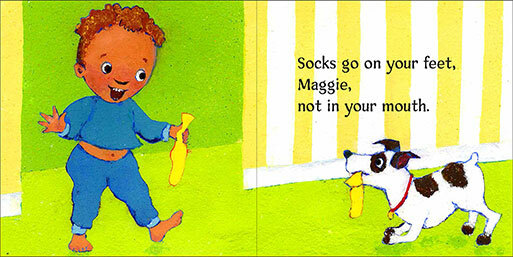 When did you start writing your own picture books and/or how did that come about? 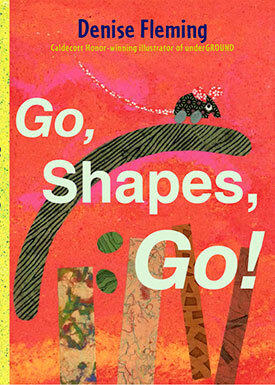 I became enamored with picture books when I was in art school, Kendall College of Design. A friend shared some picture books she had collected. They were amazing. I was hooked. I started collecting picture books when I had extra money, which was not that often. But over time I had quite a collection. I majored in Illustration and was interested in editorial illustration as magazines and drug companies bought quite a bit of art at that time. But magazines began folding and photography came into vogue. Time passed. I worked for a craft company and did freelance illustration. Eight years after I married we had a delightful baby girl, Indigo. I was reading picture books daily. I made a new friend who was opening a children’s bookstore. I met author/ illustrator Wendy Watson. Wendy encouraged me to go to New York and make the rounds of publishers with my portfolio. I did. I started illustrating for Random House mass market. It was great training, but I had my own idea of books I wanted to do. So I took two years off and started writing. (Yes, we were starving artists!) I also took experimental art classes. By accident, I discovered paper making. The terse verse I had written went well with the pulp paintings. I went back to NY and made the rounds. 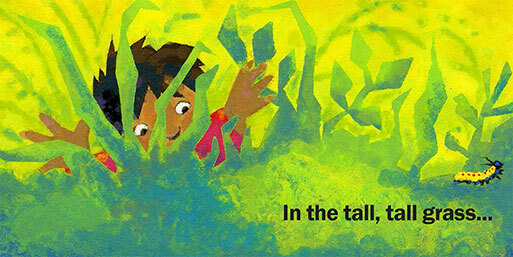 Laura Godwin, the best, offered me a two book contract for IN THE TALL, TALL GRASS and COUNT!as author/illustrator. My first book came out in 1991. Twenty five years ago! It was very well received! Whew! 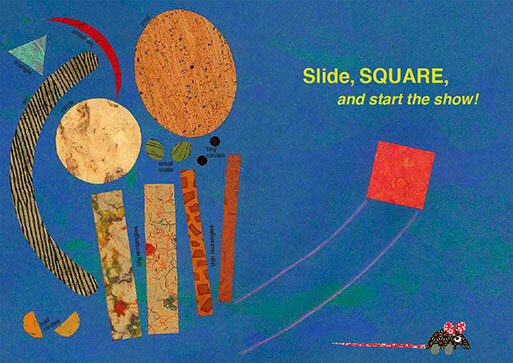 How did you get your idea for Caldecott Honor Book, IN THE SMALL, SMALL POND. 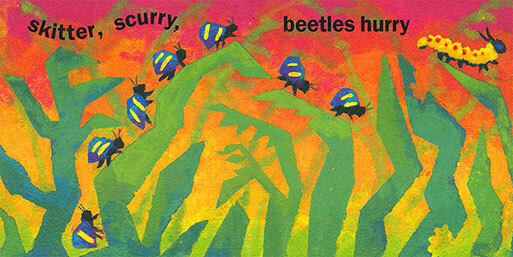 I wanted to do a companion book for IN THE TALL, TALL GRASS. We nixed IN THE DEEP, DEEP POND for obvious reasons. Do the words or the illustrations come first for you? Usually, the words come first. But as I am a visual person, images come with them. I also design my books and choose the type, so those images float around in my head too. I am creating the art for my next book with Beach Lane. I have been a bit frustrated, as I am using a new style, which I love, but is a bit complicated process wise. I am also dummying up several manuscripts. Both are different for me, more character driven. 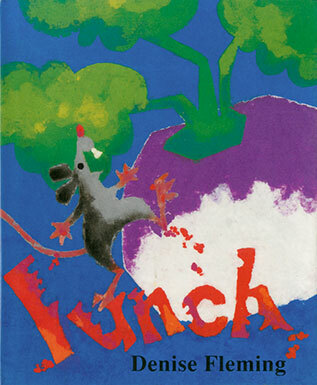 I also am working on bringing “lunch” Mouse back in a new story. I am very fond of him. What advice would you give to aspiring illustrators or author-illustrators? Don’t spend so much time on the social side of work. I think it can be distracting. Everybody offers advice, even folks who can't get published. Only follow what feels right to you. Don’t worry it, just do it ( I tell myself this all the time). And for god’s sake don’t believe your own press! I strive to create books that have a long life. Books that will be here after I am gone. I don’t follow trends. How do get your ideas/inspiration? Ideas are everywhere. The difficult part is working out the idea. Often ideas start as one thing and end up another. PUMPKIN EYE was inspired by a bas relief paper piece I did titled GREEN DOGS AT NIGHT. No green dogs ended up in PUMPKIN EYE. The dogs evolved into “Buster” who is an orange dog. IN THE TALL, TALL GRASS was from a session with my Brownie Scouts painting scenery. I kept asking them, “what is in the tall grass?” Some ideas evolve. Others die. Move on. When is your next book due out? 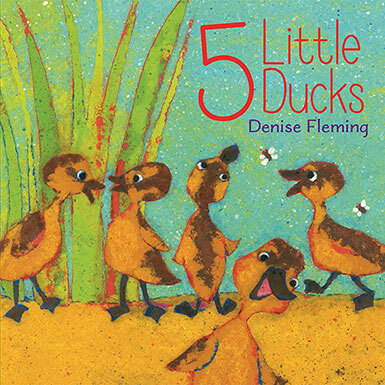 My next book, 5 LITTLE DUCKS comes out November, 2016. Could you tell us a little about your writing process? Usually I start by writing 2500+ words for a 100- page manuscript. I find I have to write all the words down to get them out of my head, even though I know many are unnecessary. Then I start crossing out, writing over, taping new words in place. I work on a legal pad in pencil. At some point I transfer the manuscript to the computer. Illustration ideas are doodled here, there, and everywhere. I do all this for quite a while until I force myself to put it in dummy form, which I find very helpful. I continue with more changes until I feel satisfied or am sick of it and my head hurts. When the manuscript is pretty tight I send it to the editor. I have already talked about the idea to her. Recently, I have been sending dummy and manuscript together. Even as I work on the art I may make text changes and even after that I may make changes. Ha! Can you tell us something that most people don't know about you? I am a hermit at home. Denise Fleming is the award-winning author and illustrator of many well known children's books including In the Tall, Tall Grass, Barnyard Banter, Mama Cat Has Three Kittens, and In the Small, Small Pond, which received a Caldecott Honor and her most recent book Maggie and Michael get dressed. As a young girl, Denise used to spend hours in her father's workshop cutting, gluing, carving and building things. Today, she spends many hours in her own workshop studio, cutting, gluing and creating her picture books. Denise's unique papermaking technique Is a labor-intensive process that involves hauling buckets of water, mixing and dying cotton fiber pulp. She then pours pulp through hand-cut stencils to form her bold, textured Illustrations. Denise's love of language is apparent in her writing which combines rhythm, rhyme and lots of verbs. For more information about Denise Fleming and her books, visit her online at denisefleming.com. Absolutely LOVE your work!Brilliant use of color and composition. Thank you for sharing your process and wishing you a ton more success! I enjoyed reading the interview! Love your books, Denise. Being a hermit at home works for you, Denise! Wonderful work and a very lovely journey you've been on Denise!! I look forward to reading your delightful books! Hey Denise, I have been a fan of your books for a long time. They have inspired me down a path of writing and illustrating. I fell in love with the colors, texture and the process of paper making that you use in your illustrations. Wishing you all the best!